Palmer Johnson’s 41.7m motor yacht Syrenka, formerly Lady Jenn has joined the charter fleet at Bartram & Brakenhoff with Charter Manager Pila Pexton. This popular charter yacht has just been appointed with a refreshingly comfortable new interior featuring supple leathers and soft furnishings in shades of blue, white, ivory, and brown. Notable recent enhancements include extra-wide passageways, an elevator, and wheelchair accessibility on three decks. A wheelchair is also available on the yacht. 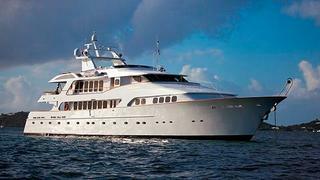 Syrenka cruises in the Caribbean and New England at weekly rates starting from $100,000 plus expenses.